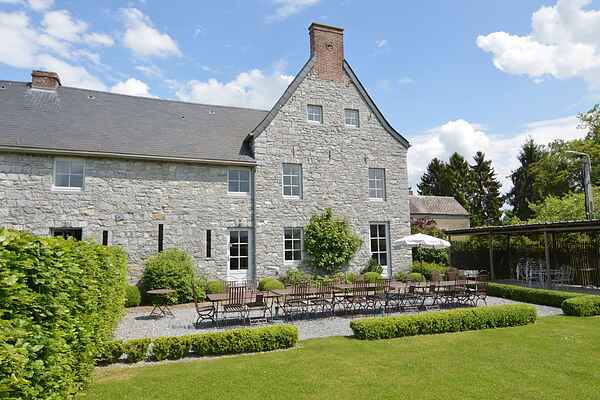 Luxurious and comfortable farmhouse situated on an estate of 2 hectares near Maredsous. The house is ideal for large family parties. The owners of this luxury farmhouse offer you access to their private holiday home. Peace, space, charm and comfort are the key words for this enormous holiday home of 650 m2. There are nine beautiful bedrooms, each with their own bathroom or shower and toilet. Additionally, there are two pleasant and cosy salons and a large garden from where you have a beautiful view of the surrounding landscape. A new wellness area is accessible during your stay. Possibility of massages and beauty treatments by Sylvie Gieling (by appointment). Maredsous lies in a higher part of the valley of the Molignée, in the region of the Meuse and Dinant.